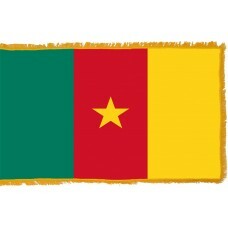 The Cameroon flag is comprised of 3 vertical bands with the colors green, red, and yellow. There is a small, yellow, 5-pointed star in the center (on the red band). The flag symbolizes "Hope, Independence and Unity." The green color signifies the country's rich vegetation and aspirations for the future, the red color is symbolic of independence, and the yellow color represents the sun as well as the soil and savannas in the country. The star in the center signifies the unity of the country as it was composed of both French and English territories. The colors and sequence of the Cameroon flag were derived from the Ethiopian flag and Cameroon is the second African country that uses the Pan-African colors on the flag. The Cameroon flag has been changed throughout history. In 1884, Cameroon became a German Colony and had a flag with 3 horizontal bands, in the colors of black, white, and red and with an elephant in the center. The name of the country at this time was "Kamerun." Following World War I, in 1919, Cameroon was divided between France and Great Britain, known as the British Southern Cameroons and the French Cameroons. France ruled the East from Cameroon's capital, Yaounde and the British ruled the West from Nigeria. During this period from 1922, the flag was blue, with a Union Jack in the top left corner and a white circle on the right-hand side with British Cameroon written inside it. In 1960, France granted independence to Cameroon and on February 20th, 1960 a new flag was raised with the green, red, and yellow horizontal colors that it still has today. In 1961, the British Southern Cameroons united with the French Cameroons and created a federation. Once again, the flag was changed. 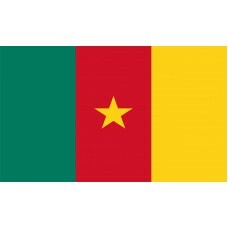 It kept the tricolor it adopted the year before and two golden stars were added in the green band at the top to represent the British and the French and it was known as the "Federal Republic of Cameroon." The Cameroon flag remained like this from 1961-1975 and was changed again on May 20th, 1975, when the British and French states unified and remains the same today. Cameroon is a country in Central Africa that shares borders with Nigeria, Chad, Central African Republic, Equatorial Guinea, Gabon, Republic of Congo, and the Atlantic Ocean. It is known as one of the wettest countries on Earth due to the heavy rainfall it encounters each year. Its capital city is "Yaounde" and its largest city is "Douala." Due to its varied culture and geography, it is referred to as "The hinge of Africa" or "Miniature Africa." Cameroon is a country of many beautiful sights and landscapes. It is a country that has beaches (the best beaches in Africa), deserts, mountains, savannas and rainforests. It is home to the Dja Faunal Reserve which is not only one of the largest rainforests in Africa but also the best protected. This is surrounded by the Dja River. It is also home to the Royal Palace of Foumban which is the oldest palace in Africa, dating from centuries before and acts as the Sultan of the country's residence as well as home to Mount Cameroon which is Cameroon's highest point and has an active volcano. O Cameroon, Thou Cradle of our Fathers, Holy Shrine where in our midst they now repose, Their tears and blood and sweat thy soil did water, On thy hills and valleys once their tillage rose. Dear Fatherland, thy worth no tongue can tell! How can we ever pay thy due? Thy welfare we will win in toil and love and peace, Will be to thy name ever true! Land of Promise, land of Glory! Thou, of life and joy, our only store! Thine be honour, thine devotion, And deep endearment, for evermore. From Shari, from where the Mungo meanders From along the banks of lowly Boumba Stream, Muster thy sons in union close around thee, Mighty as the Buea Mountain be their team; Instil in them the love of gentle ways, Regret for errors of the past; Foster, for Mother Africa, a loyalty That true shall remain to the last.